Remember when you were young and thought how cool would it be to build some sort of architecture with toothpicks, LEGOs, clay or all of them combined? 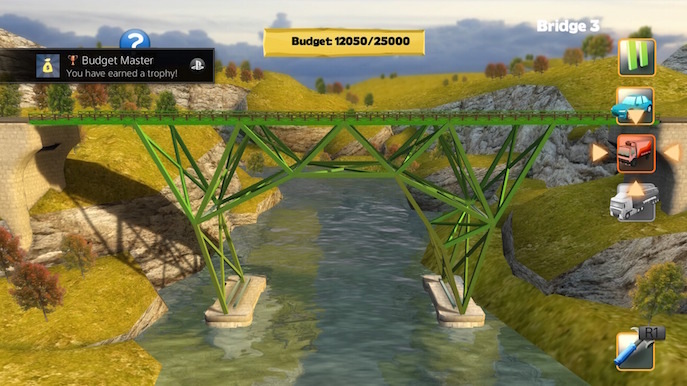 Well in any case, Bridge Constructor makes its way to the PS4 to fulfill your childhood dreams via appealing graphics, relaxing music, and a whole lot of physics to make you think how smart or not-so-smart you are when it comes to stability, symmetry and general building. 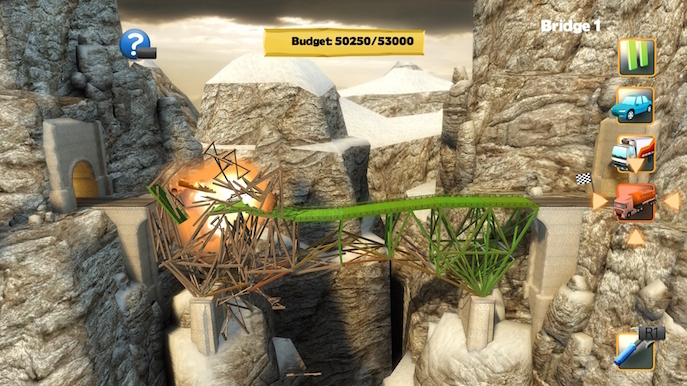 This is an amazing physics-based puzzle game by Headup Games. The objective of the game is pretty straightforward. You must build bridges for an island for vehicles to come across. You’re given different materials like wood, concrete, steel or cable. 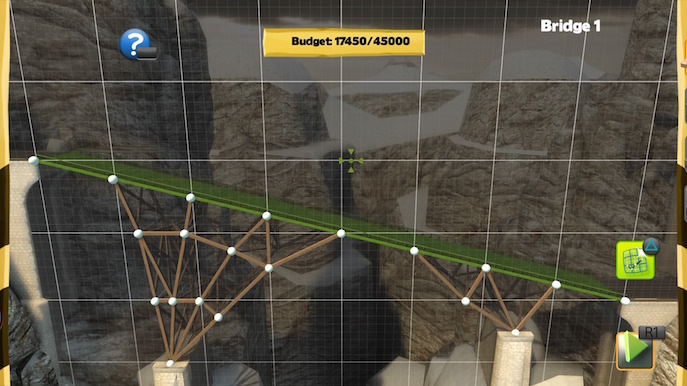 On each level you must build a bridge with a specific amount of budget, pick your structure wisely as some levels either limit your budget or the materials you can use. The clever thing about the game is how even though levels look some what the same, they vary on the distance the vehicles must travel, making you think and do some old fashion trial and error with what you got. During test runs you can notice which parts of your bridge are weak in terms of weight or stability when they change color from green to red. If these pieces become to fragile they will break and the bridge will collapse, forcing you to do another brainstorm. 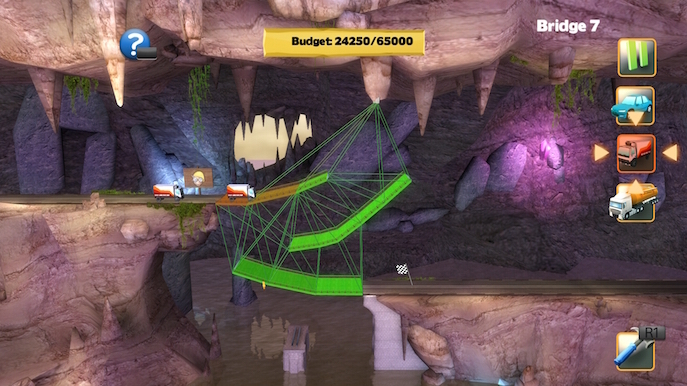 Once you make a nice looking and stable bridge, you can choose which type of vehicle it can cross. The easiest one is a couple of cars, which drive not so close to each other and don’t weight too much, if both reach the other side successfully you, will beat the level. 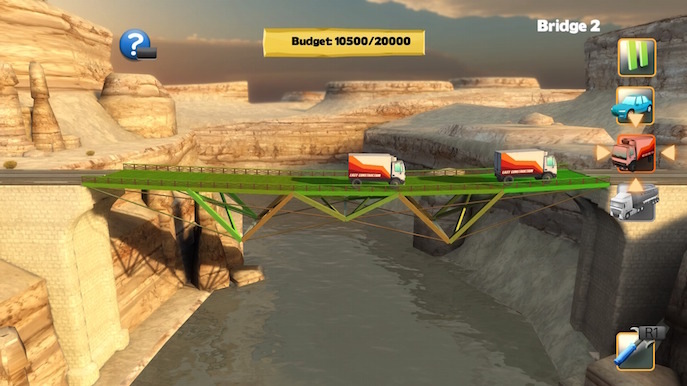 On the other hand, if you want to earn more points to brag on the leaderboards, you can build an even more extraordinaire bridge, and make trucks drive across it. These are much heavier and slower, meaning more time to test if your structure will break or not, but hey, if they go through you will earn bonus points and a golden stamp on the level. The game features a nice grid view for easier building and placement. It allows you to better connect joints for each of the materials. It is recommended that one connects to these specific joints and not on somewhere else, because if you test run, that piece will simply fall of because it isn’t “connected” to anything, even if the 2D view looks like it does. To make matters a bit easier you can zoom in and out to make sure, but it’s pretty straightforward. 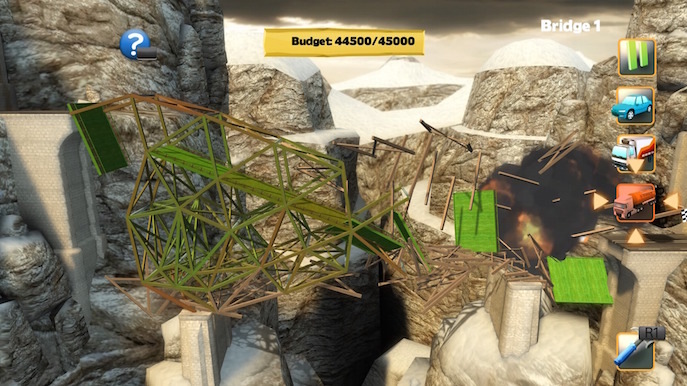 Bridge Constructor is a simple port that simply works well. The magnetic dropping of joints when placing materials can be a little weird at times, but it does its job. A highly recommended game for all ages, since the solutions to these puzzles can also be as crazy as possible, just make sure to keep those vehicles safe!